I was just looking at flights from "North America" to ICN (Seoul, Korea); I observe that the price varies greatly depending on your departure city. So, LA (seems to be) drastically cheaper than SF, Vancouver is different again, etc. The price difference can be very dramatic. In some contexts it's possible to choose "where you leave from" (imagine you're doing a lot of business travel, or incorporating other visits, etc). In fact, is there a site that finds the cheapest fares in this concept? 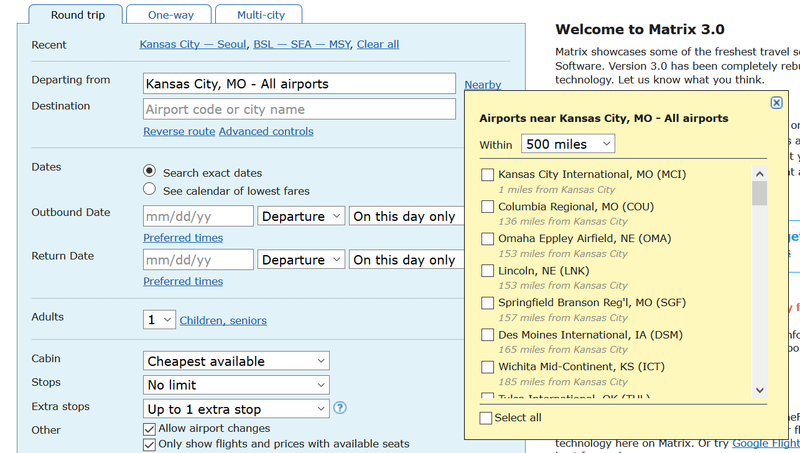 So, "From which city in the US is the cheapest flights to ICN?" Or any similar "any part of country X to..." search. 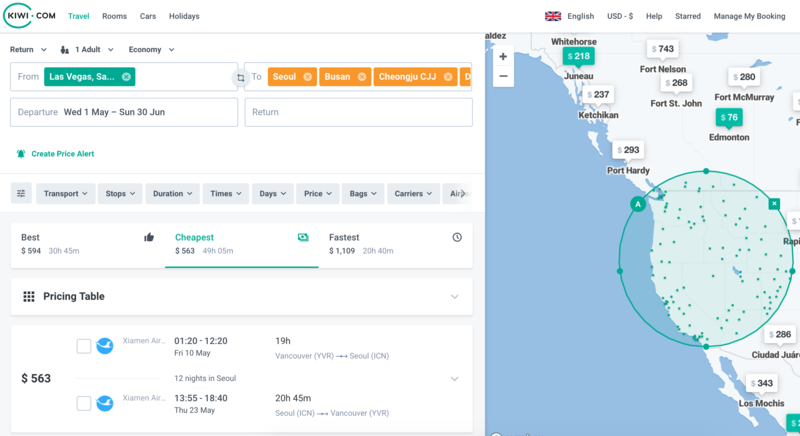 Google flights gives you a limit of 5 departure airports, while ITA Matrix https://matrix.itasoftware.com/ does not. Select some central departure airport, click "nearby" and tick all airports you want to query. 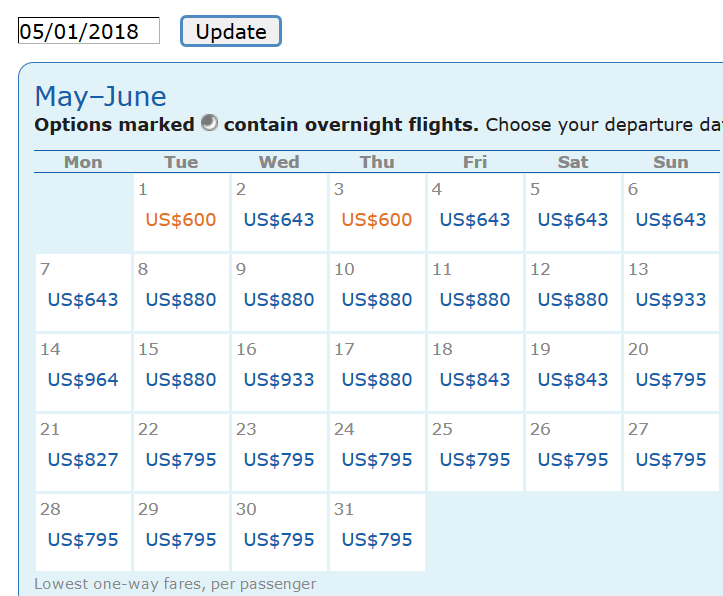 Set destination and set "calendar of lowest fares" option Result: a table for all days of the month linking any selected (i.e. US airport) to ICN. Caveat: some airlines, mostly low-cost carriers are not found in ITA matrix (but they show up in Google flights). Depending on your route, this may have a significant impact. Technically, skyscanner has such an option (disclaimer: I never used it and have no idea on how cheap/convenient it is). You simply type US in From field (and select 'United States' from suggestions list) and ICN in To, and choose 'Whole month - May' as departure/return date. I suspect other widely used search aggregators do as well. You could use Google Flights: https://www.google.com.br/flights. It's not exactly what you're looking for, but you can select lots of citys to depart from to one or more destination. As an example: Depart from: NYC, LA, SF. To: ICN. You can mark flights and see the price variation on a daily basis. In some cases, you can even book the flight through it. If you are looking flights that include a connection, do note that some of the flights they sell are budget connections that have different risks than "normal" flights. Not the answer you're looking for? Browse other questions tagged flight-search-engines fares or ask your own question.